PETITION: Gorillas in Danger! Stop the SuperHighway. PLEASE SIGN! 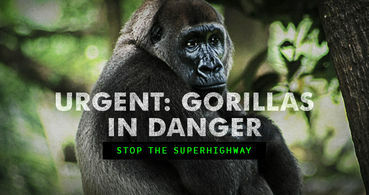 Send a message to Governor Ben Ayade to thank him for dropping the destructive 12-mile buffer and to urge him to reroute the superhighway to save the rainforest for the gorillas, elephants and other species who call it home. Thank you for speaking out about the Nigerian Superhighway. Message sent; thank you Simone. >>> PLEASE NOTE: This is NOT the same petition as before!!! This updated version was just posted on Feb. 20 to reflect the recent developments. "We only have until March 13 to stop them from bulldozing irreplaceable rainforest. The superhighway MUST be rerouted. Sign the petition now. On Wednesday, Feb. 15, the government of Cross River State announced they have canceled plans for the 12-mile-wide buffer for the proposed superhighway through the state. This is a huge win for wildlife and the Ekuri People, but vital habitat for the highly endangered Cross River gorilla, as well as chimpanzees, forest elephants, and pangolins is STILL in the superhighway's path of destruction." Thank you for speaking out about the Nigerian Superhighway. With your help we’ll be able to make sure that critically endangered Cross River gorillas and other threatened species are protected from their habitat destruction.